Imagine all of the Best Fantasy Sports sites from around the internet aggregated into one place, a widget you can easily embed into your website with an iframe or install as a WordPress Plugin. Well you can stop wishing, Fantasy Knuckleheads has put together an aggregation of the Webs Best Fantasy Sports Content ready to easily display on your website. Contact Kurt Turner to get started. The widget will conform to your websites! No matter how big or small your sidebar is, the widget auto-adjust to your websites settings! Many blog networks have syndication widgets just like this one because they know the obvious; it increases page views and readers! Most fantasy sports nuts read between 7 to 8 fantasy sports sites. This widget keeps those readers within our network while opening the door to websites they may have never found. 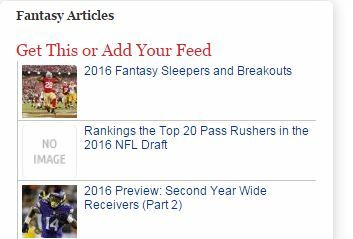 Quality websites screened and constantly monitored by the crew @ fantasyknuckleheads.com ensure only the best content for your readers. Now that you’re ready all that’s remaining is to contact me via our contact form, just include your URL and contact information and I'll be in touch within 3 business days. Only established websites with quality fantasy sports content are considered for inclusion to this fantasy sports network. Only those webmasters which run this widget on their website will have their content displayed on the widget. If you remove the widget from your website your website will be programmatically removed from the network. Basically, if you run the widget on your website then your website will be included in the network syndication and if you ever remove the widget you’ll be removed from the network. We've broke the widget out to contain fantasy football content only. Here's some of the content you'll find within the widget from Fantasy Knuckleheads. How to consistently win on fanduel and draftkings.